When students are struggling with reading and don’t show the least bit of interest in getting better at it, their academic achievement suffers across the board. Once teachers hear the warning bells they may take steps to discover if a learning disability is the problem. However, if a disability isn’t at play it could be the student is suffering from reading anxiety. Just like the fear of heights, reading anxiety is a phobia. It’s associated with a strong negative emotional reaction toward reading. When the student’s intellectual curiosity and attempts to read become linked to the disapproval of a significant other (such as a teacher, parent, or friend) anxiety sets in. 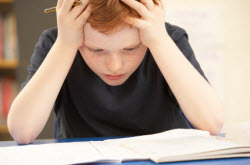 While a teacher cannot officially diagnose reading anxiety there are red flags along the way. Usually during reading time these students will say something like “I can’t do this” or “I don’t get it.” These statements relieve the responsibility of even having to try. Often times they have the skills to read but are too overcome with anxiety to use them. On the other hand, the student may take the attitude of “I know how to read, but you can’t make me do it.” Or “I can’t read by myself. You have to help me.” This happens when someone has either removed all accountability by doing everything for the student or by doing nothing at all for them. As alarming as it sounds, this does take place in both the classroom and at home. Obviously, these students require a lot of reinforcement and guidance. Their phobia eats away at their self-confidence. They need a lot of sincere positive feedback and praise in order to move forward. By asking non-threatening questions, teachers can discover a lot about how students feel about reading. Ask if the student likes to read at home or alone in their room. If they don’t like to read, why not? Do family members or friends like to read? Ask what they do when they get stuck on a word – use a dictionary or ask someone? How do friends feel about reading? The answers can help guide the teacher toward the important next step. This may include referring the student to the school counselor or school psychologist. Then the struggling reader can begin to get the remediation they need to find reading success.